The Expendables is a film that will delight twelve-year boys, and anyone who is willing to become a twelve-year-old boy for its running time. It’s the kind of film that isn’t quite complete without a detailed analysis afterwards in the school-yard. But even if that isn’t an option for you, you can still have tons of fun with this film—once you’re willing to get into its spirit. A troupe of action stars are involved– including Sylvester Stallone, Jet Li, Mickey Rourke and Dolph Lundgren– but Jason Statham was the main draw for me. Ever since he appeared in Lock, Stock and Two Smoking Barrels—was it really twelve years ago?—he’s lit up every film I’ve seen him in. I think Statham’s character—and he always plays the same character– is the kind of buddy we’d all like to have. The kind of guy who would always get you into trouble, and always get you out of trouble, and then tell the story in pubs, amidst much hilarity, for years to come. Above all, The Expendables is a celebration of male cameraderie. The end credits roll over “The Boys are Back in Town” by Thin Lizzy, and that rousing anthem has seldom been used more appropriately. The Expendables are a group of mercenaries who hang out in a tattoo parlour, ride motorcycles, have knife-throwing competitions, and engage in perpetual banter. They might as well hang out in a tree-house and swap comics; the basic principle is the same. I was never a part of one of those boys’ clubs. I think that’s why I enjoyed The Expendables as much as I did. Of course, the job that provides the main plot of the movie—a plan to liberate a fictional Spanish American island from its military dictator, and the rogue CIA agent who pulls his strings—is not a stroll in the park, but (as Micky Rourke’s character describes it) a jaunt “to hell and back”. At one point, it even seems—gasp!—as if Sylvester Stallone, the leader of the troop, is going to have to go on his own. But of course, that doesn’t happen. What could be more unforgiveable to a twelve-year-old boy? So the Expendables find themselves in a tin-pot dictatorship, surrounded by trigger-happy but surprisingly inaccurate soldiers, out to rescue a beautiful dissident and topple the regime. Did I mention the beautiful dissident? Oh well, it doesn’t matter. The romantic sub-plot involving Jason Statham doesn’t matter. The pretext for introducing Arnold Schwarzenegger and Bruce Willis in cameo rules doesn’t matter. Nothing matters, except a bunch of veteran action stars throwing grenades, swapping one-liners, and being best friends forever. 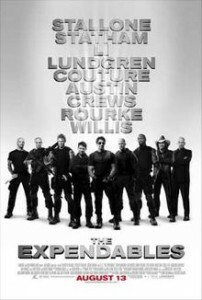 The Expendables is the Sisterhood of the Travelling Pants for boys..